Background: DNA polymerases and topoisomerases are proteins that play a vital part in DNA metabolism such as replication, transcription, recombination, and chromosome segregation during mitosis. For this reason, these enzymes are appreciated targets for the development of cancer chemotherapeutic drugs. Method: All compounds evaluated in this work were obtained under the conditions and using the reagents described in the Schemes (1-3). Polymerase Chain Reaction (PCR): Sample stock solutions were prepared at a concentration of 10 mM in dimethyl sulfoxide (DMSO) using 1 ml as a final volume. The PCR master mix consisted of 2.5 µl of PCR Buffer (40 mM Tris-acetate, pH 8.3), 0.5 µl of MgCl2 at a concentration of 15 mM, 2.5 U Taq DNA polymerase, 2.5 µl of each oligonucleotide primer at a concentration of 100 mM, 0.5 µl of each deoxynucleotide triphosphates (dNTP) at a concentration of 10 mM and 0.1 µg/ml of DNA template. Topoisomerase I activity was determined by relaxation of supercoiled pBr 322 plasmid DNA. The reaction mixture in 20 ml contained 35 mM Tris-HCl, pH 8, 72 mM KCl, 5 mM MgCl2, 5 mM DTT, 5 mM spermidine, 0.01% bovine serum albumin, 0.64 mg/20 ml supercoiled pBr 322 DNA, 1.5 U human topoisomerase I and 1 ml of test compound diluted with DMSO. Results: Faithful replication of DNA molecules with the intervention of DNA polymerases and topoisomerases is essential for genome integrity and correct transmission of genetic information in all living organisms. For this reason, DNA polymerases and topoisomerases have emerged as important cellular targets for chemical intervention in the development of anti-cancer agents. 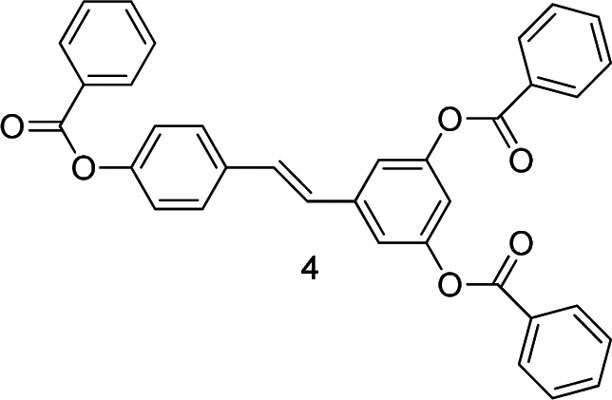 Herein we report the semisynthesis of resveratrol derivatives and similar compounds and their biological activity against Taq DNA polymerase and topoisomerases. Compound 4 was the most active against both enzymes with IC50 values equal to 18.56 and 28.37 µM, respectively. Additionally, compounds 3 and 5 showed interesting activity against Taq DNA polymerase with IC50 values equal to 76.89 and 71.65 µM, respectively. Conclusion: In summary, one compound (4) was found to have excellent inhibitory activity against human topoisomerase I and Taq DNA polymerase. This compound can be a leading molecule for the development of original anticancer treatment and an excellent instrument to explore DNA polymerase and topoisomerase activity. Keywords: Resveratrol, DNA polymerases, natural products, human topoisomerase I, stilbene, dideoxynucleotides. Keywords:Resveratrol, DNA polymerases, natural products, human topoisomerase I, stilbene, dideoxynucleotides. Abstract:Background: DNA polymerases and topoisomerases are proteins that play a vital part in DNA metabolism such as replication, transcription, recombination, and chromosome segregation during mitosis. For this reason, these enzymes are appreciated targets for the development of cancer chemotherapeutic drugs.